Our installers are skilled and experienced in the installation of two-dimensional works right through to large sculptures and public art projects. They are also able to consult, design and supply custom made object mounts, supports and plinths. Whether the installation is required in your home, office, commercial property or public space, our specialist installation team will work from a well thought out installation plan, which is prepared through client consultation and a thorough site visit. 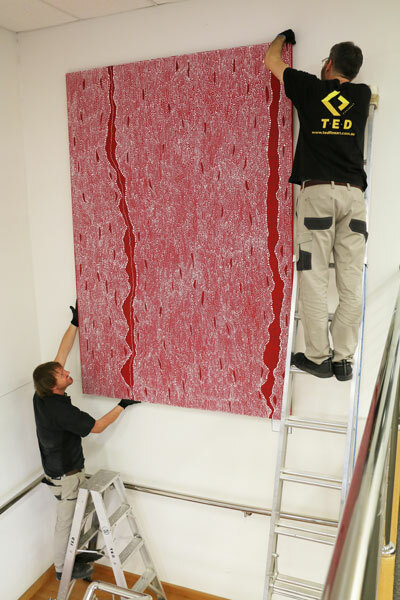 Our team will consider your artworks’ unique features, needs and foresee any installation challenges. Our installation and project staff work collaboratively with clients, artists, building managers, engineers, architects, heritage councils and interior designers to ensure that all technical, structural and aesthetic considerations are taken into account when planning an installation. Our staff has developed a well-earned reputation for their professionalism, technical expertise and calmness whilst faced with the most challenging and demanding installation projects.